These are shafted with flights fully welded to this shaft and no hanger bearings. These screws are used for all general applications and up to 10 m in length and 1000 mm in diameter. Flights can be any steel type according to the application. When stuffing boxes are fitted, the shaft always has an adjacent wear sleeve. Drives can be with chain wheels, shaft mounted or direct driven to clients request. Construction can be in mild steel or stainless. These are generally used for screws longer than 10 m and have their casing manufactured in 304 stainless steel. The casing is always lined with UHMWPE plastic material and they are driven by shaft mounted gear motors. Systems with vertical screw conveyors can be supplied. These are generally used for special cases where the conveyed material is very sticky and may otherwise cause ‘logging’ in a standard screw. We use our ribbon screws for example in our ash conditioning mixer. This can be a good feature in special applications again for some sticky materials. 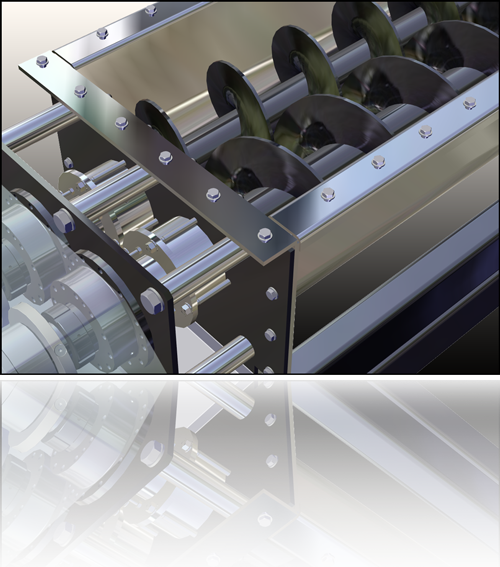 We use this design for example for the Pre-Press Screws in our Solids Handling Pumps for sludge cake.